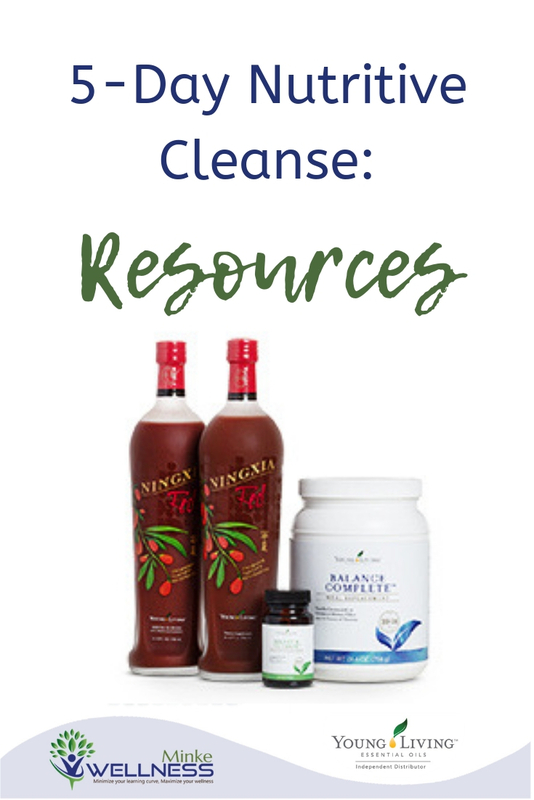 The 5-Day Nutritive Cleanse, designed by Young Living Essential Oils, is a do-able and (in my experience) effective cleanse for the colon and digestive system, with positive results affecting the whole body. 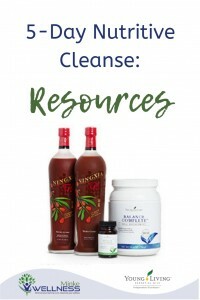 The cleanse consists of 3 high-fiber (and tasty) shakes per day with Balance Complete meal replacement, accompanied by 1 gelcap of Digest & Cleanse with each shake, and 3 servings of NingXia Red antioxidant drink per day (in between shakes). You can also supplement with snacks in between, keeping the snacks to raw and high-fiber choices, such as fruits, veggies, raw nuts, hummus, and rice crackers. This cleanse fits into most lifestyles with ease and minimal planning and disruption. I can even make meals for my family and watch them eat… I just have my shake at the same time. The Balance Complete shake is tasty — even if mixed with only water. I usually am seeking to maximize my protein intake, so I mix with organic, unsweetened soy milk. It can be mixed with your “milk” of choice. It tastes like a vanilla milk shake — so no hardship with cleansing this way! When I stick to my schedule of 3 shakes, spread evenly throughout the day, punctuated by NingXia Red shots and veggie snacks, as needed, I don’t get hungry and I don’t feel deprived! The cleanse is not meant to be a fast, but to be closer to a mono-diet — to give some rest to the digestive system. And, it is a time to flood the body with nutrients to give your body the extra resources needed during a cleanse. NingXia Red antioxidant infusion is a great way to get nutrients in a power-packed shot. The added antioxidants, both water-soluble (with berries) and fat-soluble (with essential oils), provide needed resources to help as toxins are mobilized during the cleansing process. NingXia Red also provides vitamin C and the bioflavanoids needed to help absorb vitamin C. Vitamin C is also a key nutrient in the cleansing and detoxification process! Balance Complete provides 11 grams of fiber per serving. Ever tried fiber powders?? Normally, they are gag-worthy. Not Balance Complete! The fiber is ground very finely — and it hides in the tasty vanilla milkshake! Taking your fiber becomes EASY! Once the fiber is in the colon, it absorbs water and expands, filling the tube of the colon. This is a physical cleanse of the colon as it moves through the tube with the peristaltic wave (the normal movement of the colon to push the poop out). The fiber in effect wipes or scrubs the sides of the tube and pushes the built up grime out. Also, as the fiber absorbs liquid, it pulls in toxins. The Digest & Cleanse* capsules provide antioxidant support delivered directly to the intestines and the digestive system. Antioxidants tend to help mobilize toxins. Those toxins can then be absorbed into the fiber to be eliminated (moved out with the poop)! As an added support, the Digest & Cleanse* can help maintain the balance in the gut. Sometimes, as we increase our fiber intake (or even just change our diet), the gut flora reacts and creates gas as it rebalances to the new food in the digestive system. The essential oils can help with this process. When I take the oil capsule before or with my shake, I feel a gentle, minty freshness when the capsule opens. Happy tummy! When I forget and take the shake without the oil capsule, the fiber and gas starts to fill my tummy — and get uncomfortable. Thankfully, all I have to do is take the capsule and within 15-30 minutes, it opens and I’m back to minty freshness! * NOTE: As of this writing, Digest & Cleanse (and the 5-Day Nutritive Cleanse Kit) are out of stock with Young Living. I did the cleanse successfully by substituting homemade capsules of 3-5 drops of Peppermint Vitality essential oil or DiGize Vitality essential oil blend. BE SURE TO ONLY USE ESSENTIAL OILS INTERNALLY THAT ARE LABELED AS SUPPLEMENTS!!!! (That’s why we only use Young Living!) I took a capsule at the same time as my shake — so that the it would open where the shake was in the digestive system. Here are some empty enteric coated capsules available on Amazon. Check out the blog post on my vegan (non-dairy) version! I like to keep supplements on hand that support the detoxification process. My main support is Sulfurzyme. I take 4 capsules before bed EVERY NIGHT. When needing extra cleansing support, I take 2-4 capsules during the day, perhaps even two more times during the day. Another favorite is Super C — to provide added Vitamin C. I also rely on digestive enzymes from Young Living — if you’re following the YL Wellness Program, you may have some left over from Months 1, 2, or 3 — Detoxzyme, Allerzyme, or Essentialzyme. The first time I did the 5-Day Nutritive Cleanse, I was pleasantly surprised to be able to breathe easier after the cleanse. Say what?!? I know! The colon is right under the diaphragm, and if it’s “dirty,” it can basically pollute the tissue around it. So, as it cleaned out after the cleanse, my breath felt lighter and cleaner, as if every breath was fresher air! I’ve talked with lots of people who have done the cleanse and shared my experience — by the 4th day, we don’t want any more fiber. I would look at the shake and think, “I don’t think there’s any more room in there…” But, I just kept going, following the protocol. Thankfully, there’re only five days in the cleanse — so it’s do-able. The 4th and 5th days of the cleanse are usually when I experience a cleansing reaction, if I’m going to have one. That’s when I take the extra supplements to help manage the cleansing and detoxification process. By the end of the 5th day and then the 6th day, my colon catches up and the poop gets moving out more efficiently — and I start feeling lighter, fresher, cleaner!! Generally, the cleanse isn’t one that creates abnormal bowel movement — generally, just a little slower as the fiber moves through the tube. So, I haven’t felt the need to stay near the toilet. I can function normally in my daily life. I have found it crucial to stay hydrated during and especially after the cleanse. If I don’t keep the colon hydrated and moving, I run the risk of the toxins that got mobilized getting stuck in there. I have done this. It’s not pleasant. And, drinking more water generally takes care of it! My goal is half my body weight in ounces — and then pay attention to my body after that to see if I need more to keep up with the cleanse.